The ibis Paris Porte de Versailles hotel is situated in the center of Issy-les-Moulineaux, 9.3 mi (15 km) from the airport and 0.6 mi (1 km) from Porte de Versailles exhibition center and near Montparnasse (3 mi/5 km) and Opéra (4 mi/7 km). The hotel has 78 rooms including 54 with air conditioning and WIFI and 3 for guests with reduced mobility. A bar, round-the-clock snack service and undercover paying car park are available. There are also 2 meeting rooms available for reservation. The ibis Paris Porte de Versailles Mairie d’Issy and its staff have gained a lot of experience with arranging meetings, conferences, trainings and all sorts of events. Offering conference facilities including 3 meeting rooms the hotel has been used as a conference hotel in Issy les Moulineaux on a regular basis. 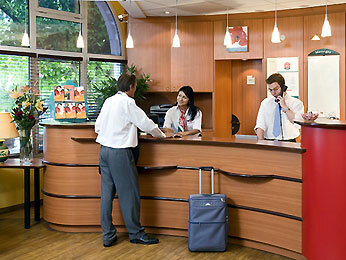 Please also have a look at the other conference hotels in Issy les Moulineaux which we are proud to present to you.